i faced issue with keyboard when i yesterday installed MX Linux (latest) as a newbie. Because default was english keyboard, when i clicked the US flag nothing happened (i thought it will offer me some language settings), i added czech keymap (click MX menu, search for keyboard, clicked Keyboard "app" and then on Layout tab add czech keymap and made sure it is above english, but that not helped to change language, i had to remove english one and then it started typing czech characters. Xorg.0.log:608:[ 24.878] (**) Option "xkb_layout" "cz-us-qwerty,us"
Xorg.0.log.old:608:[ 25.510] (**) Option "xkb_layout" "cz-us-qwerty,us"
Last edited by postcd on Tue Oct 30, 2018 7:04 am, edited 1 time in total. Welcome to the MX Linux forum. The easiest way is to choose the general keyboard, with the F3 key, in the beginning of the MX Installer. Then you avoid having to do so much searching. then choose your desired layout. 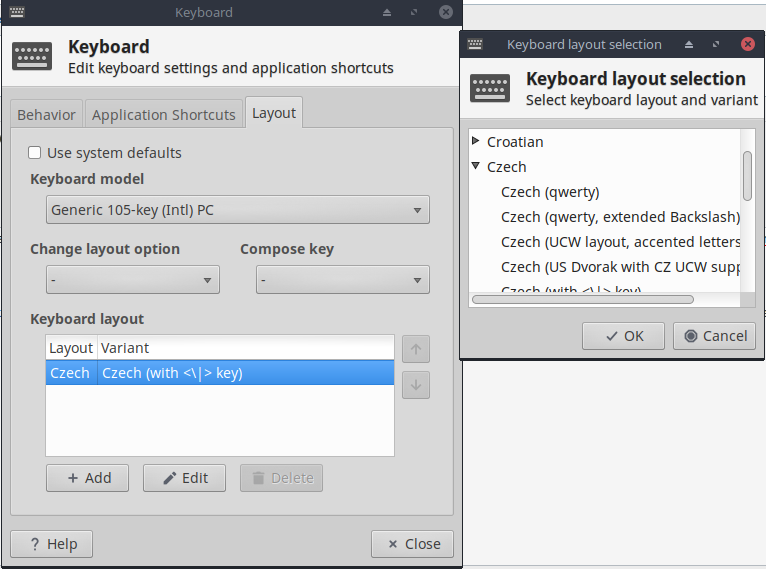 Menu > Settings > Keyboard > Layout > Add then scroll to Czech and choose your preferred keyboard. and then there's https://wiki.debian.org/Keyboard with other methods. All because it is a confusion. I don't know who you would blame. It's a common failing and a matter of trial and error to determine the correct parameter for a given keyboard. Or maybe I've just never found the correct listing. but that not helped to change language, i had to remove english one and then it started typing czech characters. How did you remove english keyboard? There is no "cz-us-qwerty" keyboard layout within the Keyboard selecting GUI nor within terminal keyboard configuration "dpkg-reconfigure keyboard-configuration"? How did you added orselected such a layout? and check/select user-session wide using Keyboard selecting gui from Settings. Note: You can avoid this by selecting proper keyboard when you install MX Linux. How did you added or selected such a layout? "when i clicked the US flag (in the left sidebar of the XFCE 4 XM Linux interface) nothing happened (i thought it will offer me some language settings), i added czech keymap (click MX menu, search for keyboard, clicked Keyboard "app" and then on Layout tab Add czech keymap (Add button) and made sure it is above english entry. I am using "Czech (with <\|>) key"
I deleted US keyb. layout by clicking the entry (was below the czech one on the screenshot) and click Delete button. Maybe i can use the Keyboard GUI app as seen on the screenshot instead of command line command, right? Because when i run your keyboard reconfigure command, it offer me same keyboard model (Generic 105 key) as seen on the screenshot above..
Maybe i can use the Keyboard GUI app as seen on the screenshot instead of command line command, right? will allow you to change system wide default keyboard layout. within the user session. This will not change the default system wide settings. Please note further do not run root-sessions. You can create more troublesome situation if you do so. the system layout you get lot's of issues. Thanks for explaining the difference between setting keyboard layout for the system (via "dpkg-reconfigure ***" command) and for the user (via GUI). Well spotted. We might think to provide an alternative solution like only display/list of a defined set of keyboard layouts at login screen. Workaround: Set system wide layout to the prefered one, so you can enter you password. And change keyboard during session with keyboard switcher or key-combo.